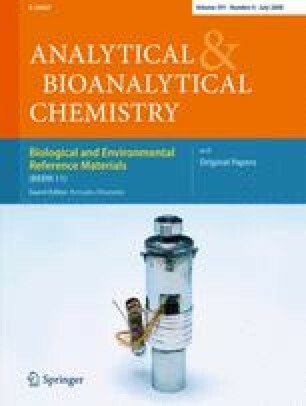 The synthesis and evaluation of a molecularly imprinted polymer (MIP) used as a selective solid-phase extraction sorbent and coupled to high-performance liquid chromatography (HPLC) for the efficient determination of sulfamerazine (SMR) in pond water and three fishes are reported. The polymer was prepared using SMR as the template molecule, methacrylic acid as the functional monomer and ethylene glycol dimethacrylate as the crosslinking monomer in the presence of tetrahydrofuran as the solvent. The SMR-imprinted polymers and nonimprinted polymers were characterized by FT-IR and static adsorption experiments. The prepared SMR-imprinted material showed a high adsorption capacity, significant selectivity and good site accessibility. The maximum static adsorption capacities of the SMR-imprinted and nonimprinted materials for SMR were 108.8 and 79.6 mg g−1, respectively. The relative selectivity factor of this SMR-imprinted material was 1.6. Several parameters influencing the solid-phase extraction process were optimized. Finally, the SMR-imprinted polymers were used as the sorbent in solid-phase extraction to determine SMR in pond water and three fishes with satisfactory recovery. The average recoveries of the MIP-SPE method were 94.0% in ultrapure water and 95.8% in pond water. Relative standard deviations ranging from 0.3% to 5.2% in MIP were acquired. The results for the SMR concentrations in crucian, carp and wuchang fish were 66.0, 127.1 and 51.5 ng g−1, respectively. The RSDs (n = 5) were 3.51%, 0.53% and 5.08%, respectively. The limit of detection (LOD) for SMR was 1 ng g−1 and the limit of quantitation (LOQ) was 3.5 ng g−1. The authors thank the National Natural Science Foundation of China (NSFC) Fund (No. 20305008, No.20775029), the Huo Yingdong Science Fund (No.104038) and the Central Teacher Plan at Lanzhou University for financial support.